The SYS-CVB1 is a live HD CCTV camera TV display system that includes an 1080p resolution bullet security camera, a 1080p BNC to HDMI video converter, a 100 foot pre-made Siamese security camera cable, and a 5 foot HDMI cable. 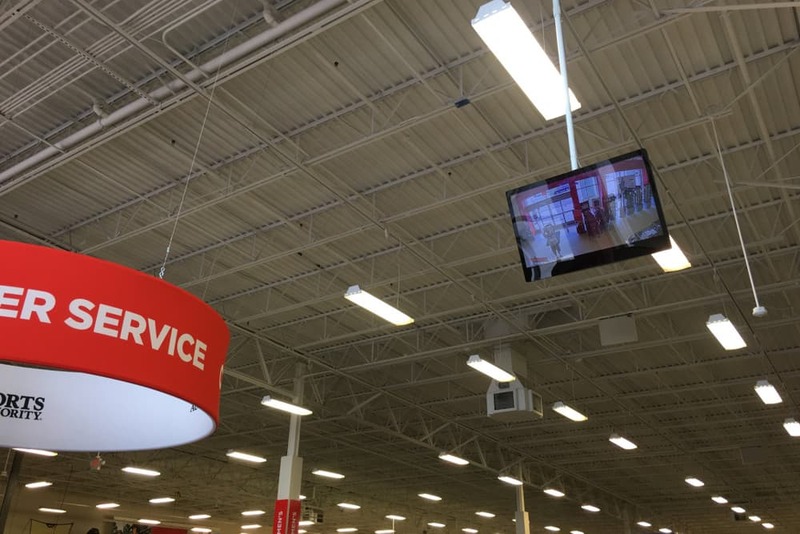 Customers typically supply their own TV monitor because any high def TV with an HDMI video input and that supports 1080p@60hz resolution is compatible. Almost all modern TVs and monitors support this resolution. This is the perfect plug and play system for customers that want to display live video from a single security camera on their TV via an HDMI video input. The vari-focal lens on the HD-BL8 is a favorite among manufacturing companies that get their equipment from CCTV Camera Pros. Want to use a different camera? Customers can use the adjustable lens bullet camera that is included with this system, switch the system to come with this 180 degree dome camera, or remove the included camera from the system and choose from any of these 1080p HD CCTV cameras that we supply. We also carry live video display systems that support multiple cameras and multi-camera views. The HD-BL8 is bullet style camera with a 3.6 to 16mm vari-focal lens and no infrared. The adjustable lens allows the angle of view to be much more narrow and zoomed in. The optional dome camera has a 180 degree fixed lens and built-in infrared / night vision. It provides an ultra wide angle of view. Both cameras are HD-over-Coax type security cameras (HD-CCTV). You can see sample photos that show the differences in the angles of view here. Setting our live camera display systems is simple. This is how it works. The coax portion of the pre-made Siamese camera cable (blue line above) connects the BNC video output of the camera to the BNC video input of the HDMI converter. The power cable built into the Siamese cable connected to the power adapter that is included with the camera and plugs into the power source near your TV. The HDMI converter also includes a 12V DC power supply that will connect to the power outlet near your TV. The HDMI cable that is included with the system connects the HDMI output of the converter with the HDMI video input of your TV monitor. The above diagram shows the SYS-CVB1 system used with a DVR. The setup is the same, except BNC loop output of the HDVC-3-T is connected to the BNC video input of an iDVR-PRO CCTV / HD surveillance DVR. Important Note: Using the loop output is optional. The BNC loop output of the HDCV-3-T can also be used to connect a second HDCV-3-T so that your security camera's video can be displayed on multiple TV monitors. These RG59 jumper cables can be used to connect the two video converters. This is an example of a live camera display used at a department store. Live security monitor displays are very typical at retail store chains. They create a theft deterrence and help customers feel safe knowing that the store uses a video surveillance system. Here are some of our best articles and installation guides related to displaying live video from security cameras.